When I picked up my 15-22 the gun shop had a stripped Anderson lower for $65 and it followed me home. I’ve already decided on a 5.56 build with a 10.5” upper. This will be double duty as a fun gun and defense. Question for now is triggers. Quality single stage is good or does it really need a two stage? The Larue trigger is $87 bucks right now, worth a shot. I have three of these Nickel Teflon triggers from Tom's Tactical...each one breaks at around 6 1/2 lbs. but with no creep or grit...$40 shipped. Question for now is triggers. Quality single stage is good or does it really need a two stage? One versus two stage is really a personal question -- it depends upon how you like your triggers to break. In my experience it's better to have triggers that are reasonably similar across multiple platforms. There are number of quality two stage triggers on the market. The Larue at $87 has to be one of the better deals. I prefer single stage triggers and have them for shotguns, bolt actions, and ARs. I currently have 5 Wilson Combat triggers in ARs. Pricey, but they're quite good. Larue triggers are the best for the buck in my opinion! Buy one and you will by them by the half dozen next time! 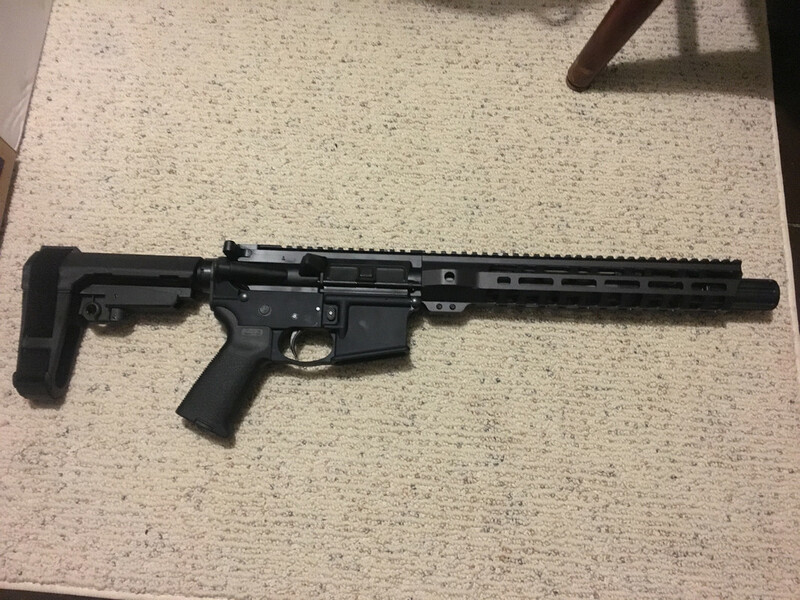 I have a 10.5" built on an Anderson lower with PSA parts. I have the 2 stage CMC flat trigger. Love it! I have a LaRue and it is a very good 2-stage trigger but I prefer single stage triggers in anything that isn't a longer range rifle. It is not hard to pull through the first stage of a 2-stage and shoot it fast, but I have gravitated towards single stages in most of my rifles. My favorite is my JP Single Stage EZ trigger. Just installed a HiperFire Hipertouch Elite in another rifle that previously had a LaRue MBT in it. I still need to suss it out but I think it will stay in that rifle. I am partial to Geissele triggers. I really like their SDC straight trigger. They have been on sale all winter long and picked up several for $112.00. I have Wilson Combat, ALG, Daniel Defense and Geissele triggers in my AR's. I like the G. best. The trigger (and all other parts decisions) were made for me thanks to Thunderson and a good deal. Just waiting for my Sig Romeo5 to get here from PSA! that looks longer then a 10.5 ? I just picked up a similar kit, except mine is grey. The can/flash forwarder is like three inches long. If you look close you can see the end of the barrel an inch or so back from the end of the handguard. It definitely looks longer but it is a 10.5” barrel. I also couldn’t pass up the deal. It was a shits n giggles purchase as are many things I have.